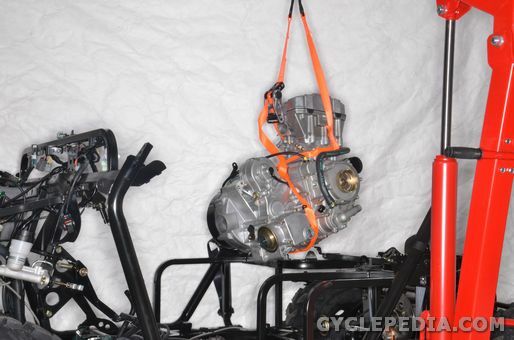 Here at Cyclepedia.com we remove and install engines for all types of motorcycles, scooters, ATVs, and utility vehicles on a regular basis. These procedures can be frustrating and even dangerous at times. We have compiled some tips to help make these tasks as smooth as possible. As with any specialized job the best place to start is with the right tools and information. Having a service manual with the order of operations and torque specs will help you get the job done in less time and make sure it is done correctly. A good selection of jacks of various types can make the difference between an easy job or a back breaker. For some very heavy engines, our technician will place a scissor jack beside the frame so he can transfer the engine to the jack and then lower it to his lift as needed. Many modern engines use thrust adjuster mounts. These allow the mounts to be retracted or removed for extra room to get the engine in and out of the frame. They usually require special lock nut wrenches. Be sure to follow the order of operations with these components, and use the torque specifications for installation. The chassis rigidity can be compromised if these fittings are not installed correctly as the engine is used as a stressed member of the frame. Improper installation can lead to a damaged frame, engine, or a poor handling chassis. 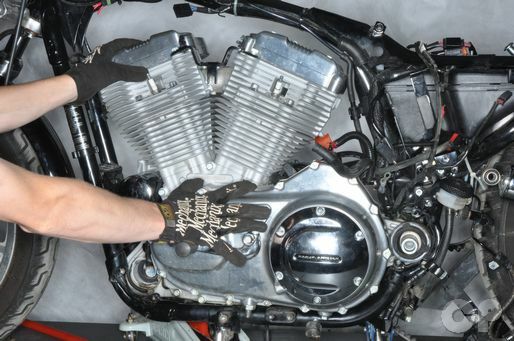 The V-twin engine is one of the most popular motorcycle engine configurations. The taller and more narrow the angle of the V the more awkward they can be to get in and out of a frame. They tend to try and fall side-to-side when they are freed from their engine mounts. It can be helpful to use a strap around the upper frame tube and engine to keep the motor from flopping to the side and falling out of the frame while you are trying to line up the engine mounts. Removing or installing an engine can result in some nasty scratches to engine and frame surfaces. Cover components in duct tape where they may make contact. 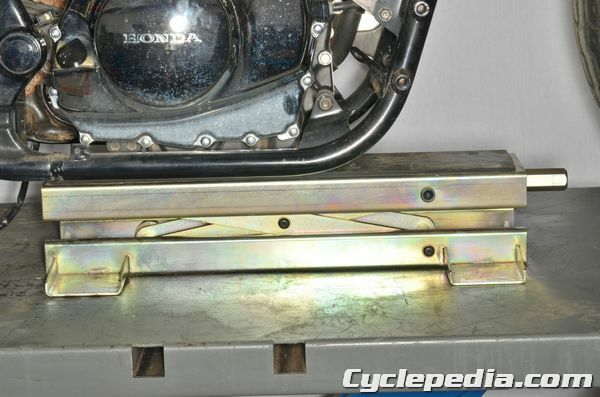 In some instances, removing an engine cover may give you more room to maneuver. 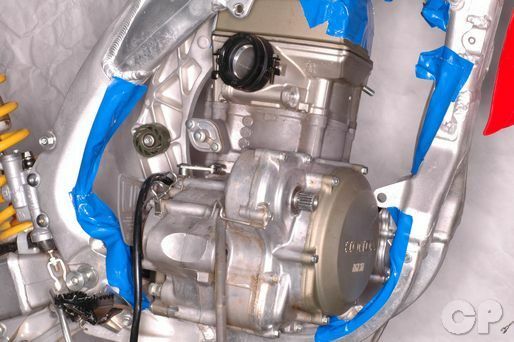 Removing the valve cover on a tall single cylinder engine can be the difference between an inch of clearance or an 1/8, just be sure to keep sensitive components from banging into the frame on the way out or back in. Side-by-side utility vehicles present their own problems with engine removal and installation. Most of this comes down to just get everything out of your way. Often, the actual engine removal and installation is easier on a utility vehicle than its ATV equivalent. A side-by-side give you more room to work, and when you are ready to take the engine out or put it back in you can use a cherry picker or engine hoist to lift the engine out or maneuver it back into place for install. 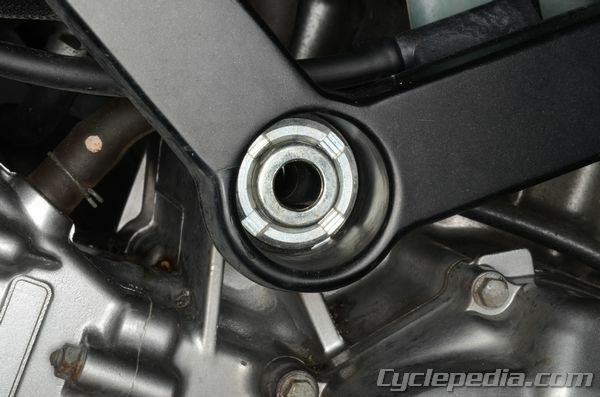 Many power sport vehicles with swingarm type rear suspension will use the swingarm pivot bolt as an engine mount. If this is the case, support the back of the frame with a jack while this pivot bolt is not fully installed. 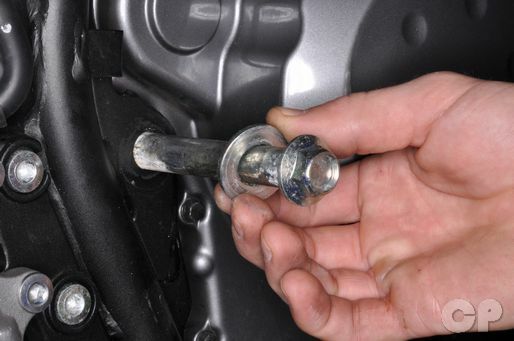 Side the pivot bolt out enough to clear the engine, but do not remove it from the frame unless you must. When the engine has been remove insert the bolt all the way to stabilize a rolling chassis. Scooters are a bit different in that the engine essentially is the swingarm for the rear suspension. Place the scooter on the center stand and guide the engine out of the back of the frame with a jack. If the center stand is with the engine, move the frame and front end forward and away from the engine like a wheelbarrow. We hope these engine removal tips have been helpful. 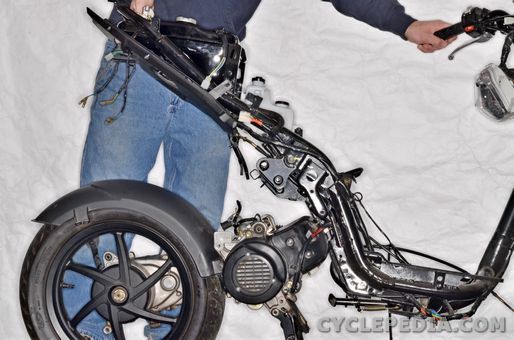 Take the time to read the manual when removing that motorcycle, scooter or ATV engine. You’ll save time and money by getting the job done right the first time.